Heat oven to 400°F. 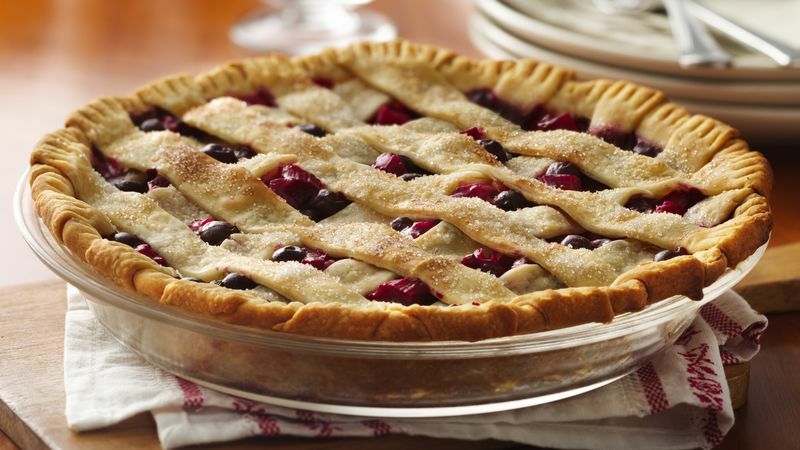 Make pie crusts as directed on box for Two-Crust Pie, using 9-inch pie plate. Cut off overhang of crust in pie plate even with plate edge. In large bowl, mix filling ingredients except milk and coarse sugar; toss gently to mix. Spoon into crust-lined pie plate. Cut second crust into about 2x1 1/2-inch rectangles. Lay in straight rows across filling, placing one corner over the other, leaving about 1 inch between rows. Place remaining dough rectangles around edge, overlapping to fit. Brush with milk; sprinkle with coarse sugar. Cover crust edge with 2- to 3-inch-wide strips of foil to prevent excessive browning; remove foil during last 15 to 20 minutes of bake time. Bake 42 to 46 minutes or until filling bubbles in middle and crust is golden brown. Cool on cooling rack at least 1 hour before serving. Get creative with the crust! Use a small cookie cutter to cut squares, circles or other shapes.